This is a fantastically easy, hearty, well-rounded meal that is wonderful for the whole family. I love cutting corn cobs into sundials – it’s not only very pretty to look at, but it makes it very easy for little hands to pick up and dig in! I created this meal after determining we had nothing to eat 🙂 I had a few fingerling potatoes, 3 cobs of corn, and about 12 shrimp in the freezer. Oh, and a shallot. I had a shallot. It really is remarkable what you can create when your laziness for going to the store beats out your laziness for cooking. I chopped up everything, roasted them, and served it all in bowls with plenty of hot sauce! This meal was made possible by the previously stated freezer staple, frozen shrimp, and a strong desire to stay home and out of the heat. We had leftovers for a few days from this, and for what was probably $5 total, I’d consider that a success. Preheat the oven to 375. Run cold water over the frozen shrimp to thaw and leave it in the colander while you cut up the vegetables. Toss the potatoes, corn and onion with about 2 tablespoons of the olive oil and sprinkle well with salt and pepper. Roast for 25-30 minutes, until corn turns golden and potatoes are tender, stirring once or twice during cooking time. While the vegetables are roasting, rinse the shrimp again and then lay them out on paper towels, blot dry and sprinkle with salt and pepper and Cajun seasoning on both sides. 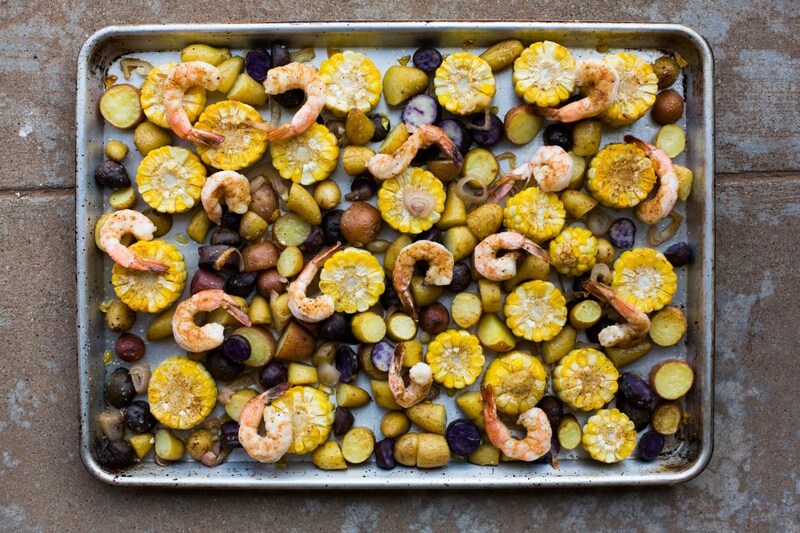 When the vegetables are almost done, take the tray out and lay the shrimp on top of the vegetables and drizzle with olive oil. Bake for 10 minutes, or until the shrimp are opaque. 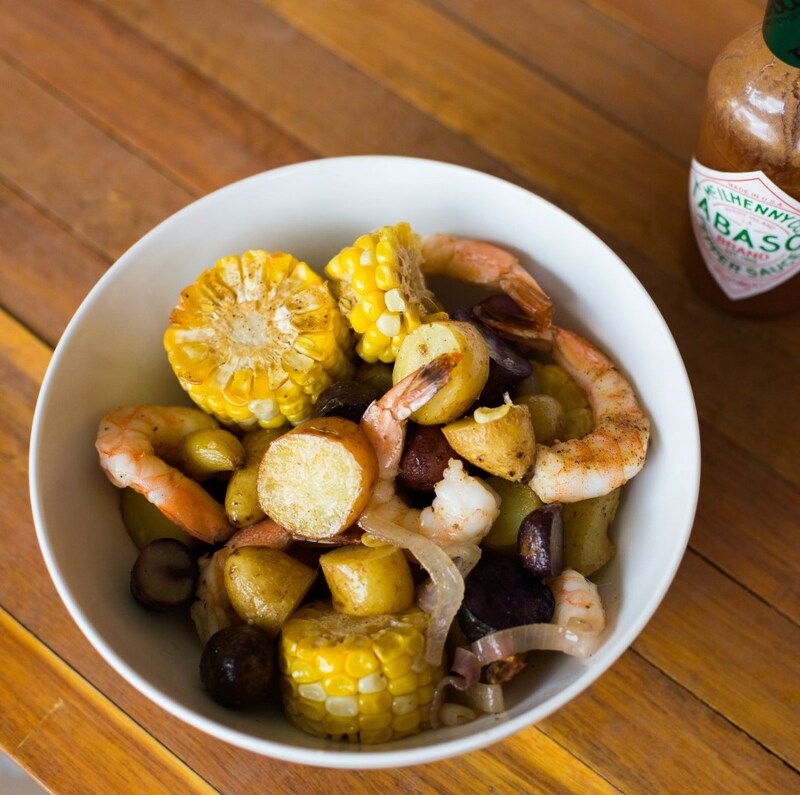 Toss everything together in a big bowl and serve with hot sauce of choice! This entry was posted in Healthy Meals, Hearty, Monday Meals, Potato Dishes, Roast it!, Roasted, Side Dishes, Vegetables. Bookmark the permalink.